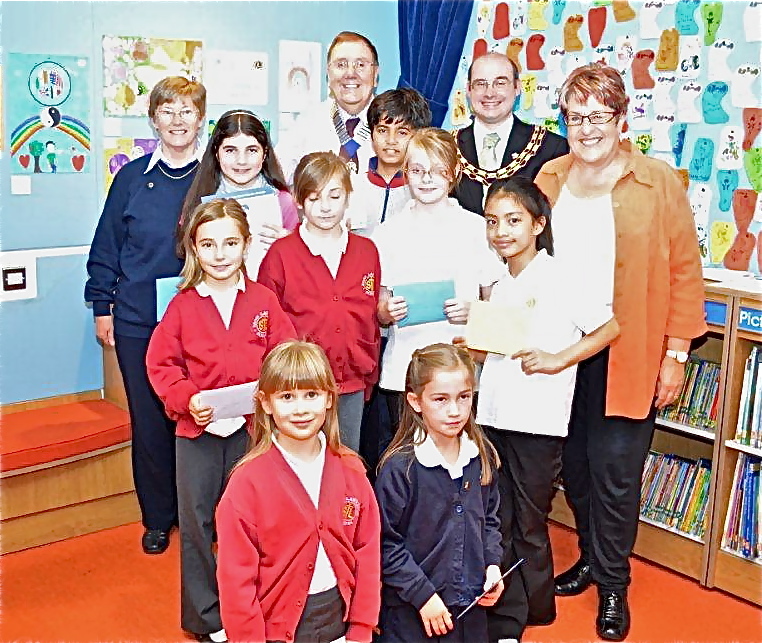 ALTON Library provided the venue for the Alton Lions annual Peace Poster competition prize giving ceremony. Part of an international competition, children were asked this year to produce a poster with the title of ‘Children Know Peace’. Youngsters from Anstey Junior School, St Lawrence Primary School and Medstead Primary School submitted entries for the competition in three different age groups. Local artist, Pam (Pell) Jones and Alan Thomas, Head of the Arts Faculty at Alton College, judged the finished posters. All nine winners came to the library to receive their prizes from Alton Town Mayor, Cllr Robert Saunders, and Alton Lions President, Peter Bacon. The winner in the 7-8 year old class was Medstead pupil Sophie Voller, with runner-up Mira Jamias and third, Katie Griffiths, both from St Lawrence. Winner of the 9-10 year old class was Sara Eccott, with second prize going to Elisha Kanwar and third prize to Amelie Budd – all from St Lawrence. Anstey Junior School produced all three winners in the 11-13 year old class, which was won by Seren Irwin, with runner-up Conrad Janjawa and third Neelesh Prasad. Commenting on the high standard of the posters, the judges said that the theme, ‘Children Know Peace’ had been difficult and open to a very wide interpretation. They had been pleased to see that the children had ventured into other media and were particularly impressed with the delicate detailed drawings and the use of chalks and pastels. When choosing the winning entries, five criteria were used: expression of the theme, originality, creativity, artistic merit and skill. In congratulating the winners, the hope was that the children had enjoyed creating the posters as much as they had enjoyed judging them. The Alton Lions Peace Poster Competition was organised this year by Lion Sarah O’Donoghue, with the help of Pam Jones. The posters are currently on display in the children’s section of Alton Library. The winners of the Alton Lions Peace Poster Competition with Alton Town Mayor, Cllr Robert Saunders, Alton Lions President Peter Bacon, competition organiser, Lion Sarah O’Donoghue, and judges Pam Jones and Alan Thomas (although the judges may not be in it).